Victor, NY— The Seneca Art & Culture Center was honored earlier this month in Albany by the American Institute of Architects (AIA) New York State with a 2016 Excelsior Award for Public Architecture. AIA New York State, in partnership with the New York State contracting agencies, created the Excelsior Awards to provide a model of excellence for future state-funded building design, professional practice, and advocacy. The projects are a reflection of the collaborative efficacy of the design and construction team. The Seneca Art & Culture Center—which opened in October 2015—received an award in the New Construction design category. "We are thrilled to receive this recognition from the architectural community,” said Ganondagan State Historic Site Manager Peter Jemison. “It gives the Seneca Art & Culture Center a unique status that is very gratifying." Designed to fit into the natural landscape, the 17,300 square foot Center features an interactive, multi-media Exhibit Gallery, Orientation Theater (featuring the award-winning Iroquois Creation Story Film), an Auditorium, Classrooms, Catering Kitchen, Gift Shop and Offices. 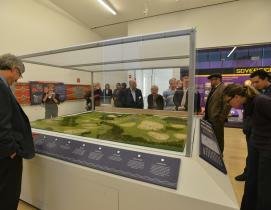 The Center tells the more than 2,000-year story of the Seneca and Haudenosaunee (Iroquois) contributions to art, culture and society through the present day.